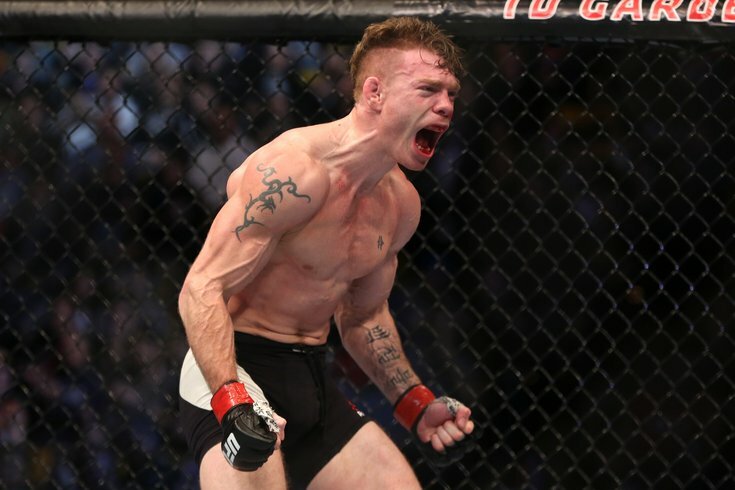 Philly's Paul Felder celebrates his win at UFC Fight Night in Boston. Everybody knows Phil. From those he’s left unconscious on a blood-stained canvas mat to those he trains with at the Renzo Gracie Academy in New Jersey, all the way to his friends at the BMF Ranch in New Mexico. And sometimes, they even greet him with a more informal moniker — Philly. The only problem is, there is no Phil. It’s not that he doesn’t exist; he’s not some figment of a collective imagination. He’s flesh. And bone. And — on nights when things don’t go his way — blood. There’s a man, sure. There’s just no Phil. That’s because his real name is Paul Felder. Not Phil. "I was talking to Eddie [Alvarez] and I was saying, 'Man, if we both get these big wins, maybe that'll motivate UFC to come back to Philly.'" "And I'm like, 'Ok, let's clear this up. My name is actually Paul. You guys call me Philly because I'm from Philly.' They go, 'Oh, s--t! We thought your name was Phil.'" Felder doesn't necessarily think that's a bad thing; the University of the Arts alum and trained actor wears his hometown proudly like a badge of honor. As does fellow lightweight Eddie Alvarez, a North Catholic grad who, after years training in Florida, returned this year to the city that taught him -- and many others -- to fight. "Philadelphia is a legendary fight town," UFC President Dana White said. "Whether you're talking about its history in boxing with guys like Joe Frazier and Bernard Hopkins or MMA with UFC stars like Eddie Alvarez and Paul Felder, Philly is a city defined by toughness, and famous for its food and die-hard sports fans. I really enjoyed filming 'Lookin for a Fight' in Philadelphia and getting a chance to watch some up and coming talent." But for all the respect Philly gets for a being a "legendary fight town," it sure hasn't seen many of them lately. At least not when it comes to the UFC. That, however, may be about to change. At 32, Alvarez (26-4), a former Bellator champ, is the more experienced of the two professional fighters. But due to spending years as arguably the most talented fighter outside the UFC, it is actually Felder (10-2) who has more experience in their current promotion. And while their fighting styles may be different, both credit mixed martial arts with helping them escape what could have been an otherwise empty life. As Felder puts it, his karate school saved him from "sitting out on those steps and drinking 40s" all day. Instead, Felder finds himself hanging out with Rob McElhenney of "It's Always Sunny in Philadelphia." While working on a screenplay, McElhenney, a St. Joe's Prep grad, stayed with Felder and Cerrone in Albuquerque for a week. Both guys are also extremely Philly. If you want further proof of that, just listen to Alvarez, whose wife went to St. Hubert's, talk for a few minutes. His accent is about as Philly as it gets. Here he is telling the story of how one of his training secrets almost made former UFC champ Frankie Edgar vomit during a sparring session. On Sunday night, both fighters were part of the card for UFC Fight Night 81 in Boston. Alvarez, the No. 4 ranked lightweight contender took on No. 1 contender Anthony "Showtime" Pettis as part of the co-main event. Felder, who lost each of his last two fights by decision, took on Daron Cruickshank. And both fighters delivered -- for themselves and their city -- in a big way. Felder, also known as "The Irish Dragon," is one of the most exciting fighters to watch right now -- a trend that continued in Boston with a third-round submission win thanks to a rear naked chokehold. And afterward, he got a little emotional. A week earlier, the new father -- he and his girlfriend had a baby girl eight months ago -- learned that his own father had been diagnosed with cancer. A few hours later after Felder's win, Alvarez pulled off a stunning win of his own -- upsetting Pettis by split-decision in just his third UFC fight since signing on back in mid-2014. Now, Alvarez could be in line for a title shot as early as this summer after beating a pair of former champs – Gilbert Melendez and Pettis – in back-to-back fights. Even Cerrone, who Alvarez lost to in his UFC debut by decision, is among the best lightweight fighters in the world. But their victories could be significant for another reason as well: UFC has not held an event in Philly since UFC 133 in 2011 before Alvarez and Felder were even fighting for them. The only other time prior to that was in 2009 for UFC 101. And now, both believe it's going to be hard for president Dana White to overlook their city much longer. "I was talking to Eddie [Alvarez] and I was saying, 'Man, if we both get these big wins, maybe that'll motivate UFC to come back to Philly,'" Felder said prior to taking down Cruickshank. "You've got two fighters at least, plus [New Jersey native] Frankie Edgar or [Drexel alum and UFC flyweight Zach] Makovsky. People would love to see that." Indeed they would. And, by all indications, the UFC would love to bring a fight -- and possibly a big one -- to the City of Brotherly Love. Unfortunately, it's not as easy as snapping your fingers and putting together a card that will not only sell out an arena, but also do well on Pay-Per-View. "I guess my big goal, my bucket list goal, would be to bring the UFC back here to Philadelphia and headline an event. That would be the ultimate treat I could give back to the fans." According to UFC Vice President of Public Relations and Athlete Marketing Dave Sholler, an Egg Harbor Township native, that's just one of the considerations that goes into planning where their next fight takes place. "In short, the reason we haven't been back [to Philly] is that we could just continue to expand internationally," Sholler told PhillyVoice, adding that they get calls every day with venues looking to book a UFC event. "It's a really fortunate position to be in, but as we've grown globally there's just been such a demand for us to go to new cities, that sometimes we're not able to get back as quickly as we like. "Fortunately, over the past few years, we've been able to get near Philly, whether it's our annual event in Newark (N.J.) or the shows we did in Atlantic City at Revel. It just hasn't come together since our last event there, UFC 133, but it's by no means indicative of a lack of commitment to Philadelphia." Sholler also pointed out that arena booking in the area can be difficult because of all the local sporting events that already take place at The Wells Fargo Center. Another option that has been rumored to be a potential site for a further UFC event is Temple's Liacouras Center on Broad Street, which has hosted boxing events in the past. Still, he thinks this could be the year UFC finally returns to town. "We're hopeful that 2016 -- maybe as soon as the summer or as late as the fall -- presents us an opportunity to come back," Sholler continued. "We just continue to navigate the dates that we have available on Pay-Per-View and through our great TV partner FOX." And it's not as though the UFC isn't trying to bring a card -- and a big one at that -- here; they just haven't had the right situation present itself. "I absolutely think [Philly is a place we're actively trying to get back to]," Sholler said. As we stand right now, we're pretty well booked through early summer in terms of where we think we're going to go for shows that would be appropriate for Philly's market size. ... So I would imagine if we head back to Philadelphia, it would probably be a card on big FOX or on Pay-Per-View. I can't rule out another card, but that's kind of where I'm leaning. But absolutely, it's on the radar." So as the UFC continues to expand globally, Philadelphia remains on the short list of cities to which the top MMA promotion in the world hopes to return. "We will definitely be back to Philadelphia," Sholler added. The question is, when will that be -- and will it be as soon as the summer of 2016? For Alvarez and Felder, the chance to fight in front of a hometown crowd can't come soon enough. And thanks to their wins on Sunday night, they moved one step closer to making it impossible for the UFC to stay out of their city much longer. 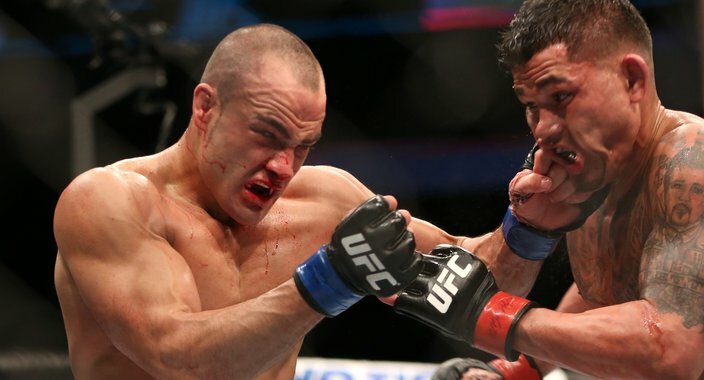 Philly's Eddie Alvarez, left, lands a punch during his upset win over Anthony Pettis. With Alvarez now knocking on the door of a title shot and Felder continuing to prove he's one of the most exciting fighters to watch -- not to mention the others that have ties to the area -- there's the potential for an event that not only features a card stacked with local talent, but also has one of those fighters getting a title shot. "Honestly, for me, that's the pinnacle," Alvarez said of the prospect of headlining a card in his hometown. "I don't know about for Paul, but I feel like, I started at 19 so for me, coming back to Philly and headlining and event here, that's the pinnacle for me. A couple years back, I wanted a head-kick knockout, and I said I'd retire. Once I did that, now, I guess my big goal, my bucket list goal, would be to bring the UFC back here to Philadelphia and headline an event. That would be the ultimate treat I could give back to the fans." "My dream is to get back to Philadelphia with a super card," Sholler said. "Not just a card that allows us to maybe bring a title fight, but a card that allows the local guys to shine." After their performances on Sunday night, that dream inched one step closer to becoming a reality.